Now that high end gaming laptops with Pascal GPUs are here in full force, it looks like motherboard and GPU wizards EVGA want a piece of the pie. Last year at CES they unveiled the SC17, which made quite an impression with its sturdy chassis and 980M GPU. 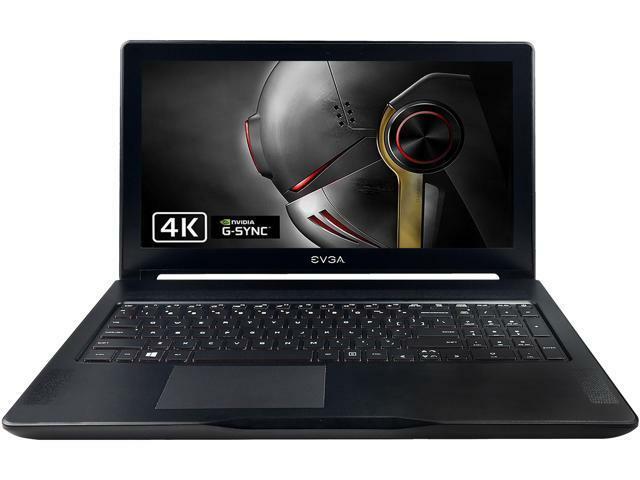 For their follow up, the SC15, EVGA stuck with the same compelling industrial inspired design, but shrank the screen to 15 inches and added a 6GB GTX 1060. This is EVGA’s first 15 inch laptop, so let’s see how it holds up. What stands out most about the design of the SC15 is the aluminum chassis. EVGA is going for the understated “is this a business computer or gaming computer” minimalist look. No crazy racing stripes or flashing lights, just black aluminum and a simple white backlit EVGA logo on the back. The front of the laptop has a recess near the center of the chassis which provides a modern look, and the slightly off to the left trackpad is an interesting twist. The hinges for the display panel stick out prominently, especially when the laptop is closed. There’s a large vent above the keyboard, as well as vents on either side and underneath to allow the fans to push warm air out when the system is under heavy load. The challenge with these 10 series GPU laptops is always heat and noise, and though I had no trouble with heat, you can definitely hear the fans ramping up when the GPU gets under load. It’s a unique look, but certainly nothing out of left field. The only potentially controversial aesthetic choice is in an unusual place: underneath the laptop. While the overall look of the SC15 is very modern business, the bottom is textured with a fabric-like material that prevents any slipping, and is most likely intended to serve as a thermal buffer between the hot aluminum and the proverbial lap in “lap”top. It also helps to elevate it off of any surface it’s resting on to allow the fans underneath to dissipate heat. These pads look a little odd, but you’ll rarely see them when using the computer, so I wouldn’t say it’s a serious aesthetic detriment. It’s more quirky than unpleasant. And who doesn’t like quirky? The aluminum chassis certainly adds durability and a classy look, but it also adds weight. We might be spoiled, but the 6.7 pounds feels heavy, especially compared to the the similarly specced Aero 15, which comes in at 4.62 pounds. Of course the Aero is plastic, so a trade off is expected, but if you’re all about ultra-portable, be aware EVGA is prioritizing durability over portability here. That’s not a bad thing as some people prefer it that way, and it’s still fairly thin at .89 inches. Once you flip open the SC15, you’re greeted with the 1080p, G-Sync enabled 15 inch IPS display. The bezel on this laptop is fairly wide, but the screen looks great once you get it up and running. The SC17 was running a 4K display, but EVGA went with 1080p for this model so they could double the refresh rate to a delightful 120Hz. Power it on (the power button is integrated into the top right of the keyboard), and you’ll see the refresh rate actually makes a substantial difference, even on the smaller screen. No going back to 60Hz now. I was surprised by how much I liked the keyboard. It’s not mechanical, but the feedback is perfect for my typing style, and it’s one of the nicest keyboards I’ve encountered on a laptop in a long time. This is subjective obviously, but I had no desire to use an external keyboard while typing, and that doesn’t happen often. Add in the four zones of RGB backlighting, and you’ve got an all around awesome typing experience. The SC15 is being marketed as a gaming laptop, and that means what’s inside is critical. Front and center is the GTX 1060, meaning 1080P gaming at 60FPS, and VR if you’re interested. We did some simple benchmarks, and found that it performed similarly to a desktop EVGA 1060 with 6GB of RAM. The laptop got a 9,473, whereas the desktop card got a score of 12,155. This isn’t a huge difference, especially when taking the difference in integrated graphics into account. Then we got our horror movie on with a few rounds of Dead By Daylight, and had no trouble getting 60 frames as we ran around trying to kill each other. Same for Overwatch. I played a few matches at Ultra settings and didn’t notice any substantial performance issues, or any serious throttling. GPU temps never got over 75C, and though the keyboard did get a little hot, it was never to the point I couldn’t use it. These were fairly limited tests, but even after running GPU-Z for over an hour, the temperature never got above 79C. Not bad. The challenge with these 10 series GPU laptops is always heat and noise, and though I had no trouble with heat, you can definitely hear the fans ramping up when the GPU gets under load. It was never loud to the point of distraction, but it’s interesting to see how each generation continues to improve in the auditory department. Keep in mind, these high performance gaming laptops limit frame rates when you’re running off only battery power. We were getting closer to 20 FPS in DbD and 30 in Overwatch when we weren’t plugged in, about the same as we experienced in similar laptops like the Aero 15. If you want optimal frames, you’re going to need to stay near a wall. Rounding out the specs are 16GB of DDR4 RAM, a 256 NVMe SSD paired with a 1TB spinner drive, and an i7-7700HQ CPU. You can overclock the GPU and the RAM using EVGA’s included Precision Mobile software, as well as keep your eye on the fans and temps, but you can’t overclock the CPU since it’s lacking the coveted K designation. The SC15 comes with the same pancake shaped power supply as its predecessor. It’s large, but the unusual shape means it’s a bit more portable than it might be if it was a traditional brick. The SC-15 also has a fairly standard allotment of ports, including HDMI and mini DisplayPort if you’re looking to utilize external displays, as well as Thunderbolt 3 capability. Nice. There’s no question the SC15 is the sturdiest 1060 laptop we’ve had the opportunity to test out. If you’re looking for durability over light weight in your gaming laptop, the SC15 could be a serious contender. The overclocking options are a draw as well, in addition to the exceptionally comfortable keyboard. The SC15 may not be the reigning champion, but what it does well set it apart as a very tempting option in the 1060 laptop market. This is only the second round of EVGA’s laptop offerings, so we’re pretty excited to see what they come up with next.